Welcome to stop #22!!! While you're here, make sure to sign up for the Sonora newsletter to learn more about the YA series and win one of those epic prizes! Sonora and the Eye of the Titans (Book #1) will be available for FREE on June 1st and June 2nd. Click HERE to download from Amazon. You can also check out the 2nd and 3rd books in the series by clicking on the images below. Now for the info that you'll need to continue on. If you have any questions, here is a link to the original post with the list of participating authors. When you've completed the secret legend, come check out my book tour. I'll be leaving Portland, Oregon on June 3rd, traveling around the US and visiting 31 states in 6 months to promote the Sonora series. Come check out the Sonora Book Tour! 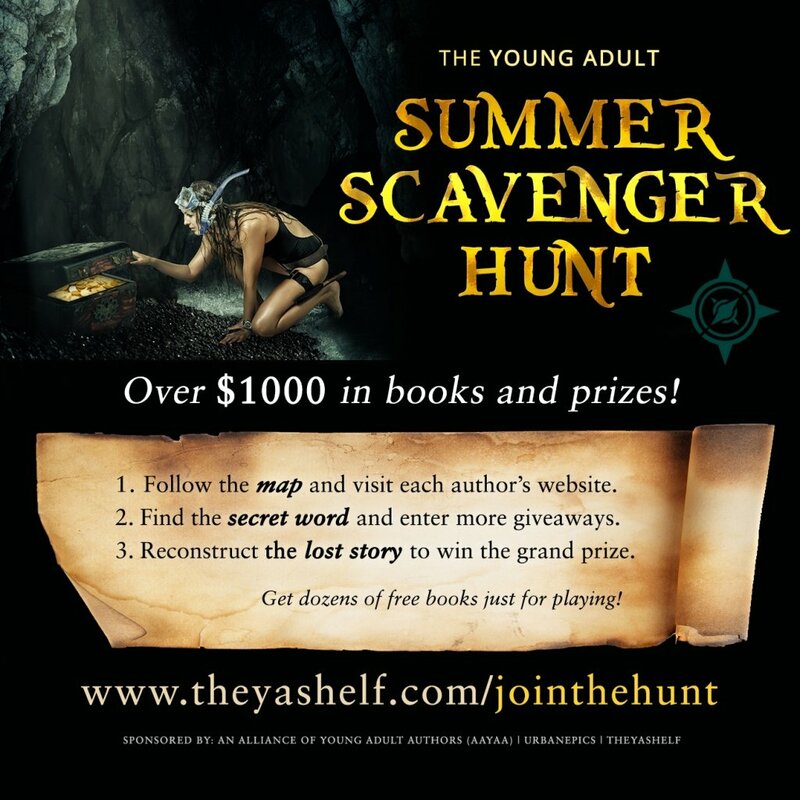 YA Summer Scavenger Hunt Giveaway! Each author will be given a special keyword, which will be bolded and all caps like this: BUTTERFLIES. All you have to do is visit all the author's sites in this order, write down the special keywords to discover the short story, then enter the giveaway with the completed secret legend HERE. There will be one main giveaway for the main prize, but most of the participating authors will also have smaller giveaways for free books, amazon credit and author swag, so make sure you read their post carefully to see what else they're offering while you're on their site for the keyword. Just go through the "treasure map" above to find the keywords and reconstruct the secret legend. Once you've got it, enter for the grand prize HERE. Don't forget to keep an eye out for other giveaways or free books as you search for the keywords, most authors will be offering their own prizes as well. For rules, updates or trouble-shooting, make sure to check out this main post which will stay updated. Authors will post the rules and the full list of participating authors sometime in June, and have their post up and visible on their site/blog, with their keyword, by June 1st. Readers just need to go through the list, find the words, and use the story to enter for the grand prize. Pre-Orders Ready for Book #2!!! I'm very excited to announce that book #2 of the Sonora series is now available for pre-order on the kindle. Here is a link to order your copy early! ﻿Check out a few other amazing Indie Authors! ​When I started writing my first book, I was very naive and ignorant for what was to come. What I realized after years of struggling to gain readership was that book marketing is just as intensive and important to an author as is writing a good story. I'm going to lay out a few tips in this post that may help you to navigate the intricacies of book marketing in this new age. Since your name isn't Stephen King or J.K. Rowling, you need to make a name for yourself. Branding is just as important to an author as it is for consumer products. What is your name? Are you going with a pen name, your own name, or an initialized version? I went with initials because I want more focus on my stories than my gender or my own story. Once you've decided on your author name, stick to it. Amazon isn't very flexible when it comes to changing names, and your book reviews won't switch over if you change it during the midway point (I know from experience). Who are you selling your story to? Is there a specific demographic, gender, or interest group? For the younger generation, it is difficult to gain the interest because you've got to get into places that young people will see your stuff. I would suggest going to an event, such as Comic-Con or a gaming expo or something in that realm. There are many book expos that you can sign up for as well. The easiest, and cheapest, form of marketing is to gain an audience through social media outlets. That includes Goodreads, Twitter, Facebook, Instagram, Pinterest, Reddit, Youtube, Bookbub, and others. I suggest getting these going before you ever write a single word of your book. Wattpad is also a good tool in gaining feedback on your writing. Interact with readers, authors, and others in the industry so that you can tweak your writing/story so that it will be perfect when you finally decide to release it. Plus, gaining early interest and reviews will help to get your name out there. Goodreads and Amazon are a great way to get your book out there for readers. I always do a Goodreads giveaway for at least one paperback copy of my books. This will help add your book to reader's lists of books, and Goodreads will constantly send mailings to those readers about your giveaways. Amazon is great for adding twitter followers or tweeting your messages to that social media outlet. It will also send your ebook to potential reviewers. This is one of the most important tasks you'll undertake as an author. To gain reviews for your books is crucial in gaining exposure. Amazon, and many other book blogs, will look at your reviews to assess potential for further marketing of your books. You've got to get at least 50 reviews for Amazon or Bookbub to place your novel in their marketing emails. 200 reviews with an average of 3.75 stars out of 5 is worth more than 20 reviews at an average of 4.5 stars. To start, I would suggest asking friends and family to read and review, then you've got to get readers to place that review. That is the difficult part. Bug them. It is worth it. The mailing list is essential. Its a bit daunting to get up and running. I suggest starting with Mailchimp since its free for a certain number of emails, then switch over to another mailing service. I would also suggest getting your website to pop-up a window that collects emails that you can utilize in reaching out to your fans. I would start by doing a newsletter every few months, and then every month. Include your updates, new giveaways, book releases, etc. There are many websites out there that you can pay to advertise on, but they are not very effective. I know, I've tried. Paid way to much, and didn't receive that much in return. The best course, if you are paying, is to use the Amazon Marketing Services (www.ams.amazon.com). I use keywords that relate to my novel, along with a few other authors or books in my genre. This will post your book in the display for sponsored products, and is the best way for readers to find your book. Facebook advertising is also good, but its way too expensive. I've been using Createspace since I first decided to self-publish my books, and for the most part it has been great. There are, however, some negative aspects to the service. When you begin, you are placed with a project team. Now that team seems to change constantly, and so there is no personal interaction with specific people who understand what your book needs. I would suggest not using the editing services because they don't do a comprehensive edit that includes character/plot development, descriptive enhancements, and story flow. The editing services are really only good for spelling, punctuation, grammar, and sentence structure changes. I would suggest using the formatting services, but they don't give you a word version of your manuscript, which is difficult when your trying to submit to other platforms besides Amazon. They don't give you a file when they do a kindle conversion either. Its structured as a monopoly so that you only use Amazon for your sale platform. When you are converting your paperback manuscript to a kindle file, make sure to give yourself enough time. It does require 9 days to convert, which messed up my release date. The support services are decent, but you'll get a different person every time you contact them. Overall, its probably the best service for self-publishing, but they need to improve. I hope this helps other authors as they navigate the intricacies of self-publishing! I've put together a list of the top young adult book to film adaptations that are currently in the process of being developed. Of course, these things take time so you may see these films come out next year or many years down the line, but I am still very excited for these authors. I haven't written in here in a while, so I thought that I'd give a brief update on the status of the third book in the Sonora Series. I've been working diligently on the basic outline of the manuscript, and have an overall idea of the direction. Currently, I've completed 10 chapters in the first draft, and probably have about 20 more to go. I'm really excited about this book, and the direction of these characters. There are going to be some really emotional parts of this book. As far as the cover, I've sent in the written description of what I'm looking for over to the cover illustrator. I hope to have a final version complete by the end of the summer, and will be doing a cover reveal probably sometime in September or October. It should be a really cool design. I will send out further updates as the book progresses. We are looking at July 2016 for a release date for Sonora, and the Minotaur of the Maze!